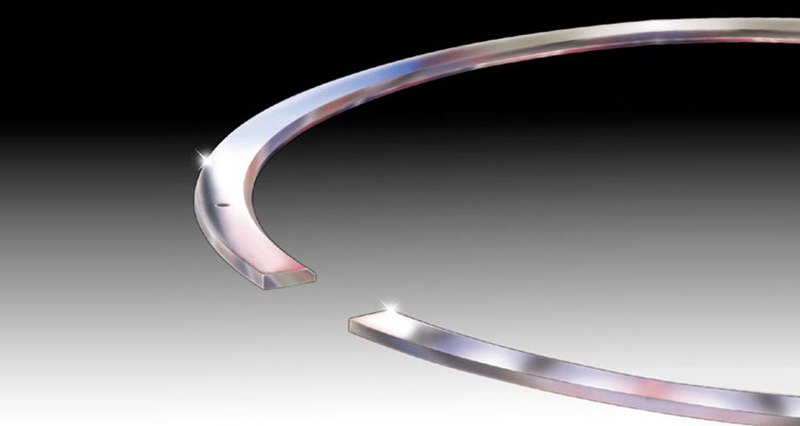 Precision machining and matching piston rings can create a power advantage by maximizing dynamic engine compression while still maintaining good oil control. This involves both proper ring selection for the intended use and diamond cutting machining procedures when gapping your rings. Piston ring sets come pre-gapped from the parts manufacturer and are not matched to precision fit a cylinder bore. That simply isn't precise enough where gaps should be accurate to within 0.001 inch or less for best engine power. The purpose of the gap is to allow enough room so that the ring can expand once the engine is hot so that the ends almost touch. The trick is to get the gap as small as possible when the engine is hot without the ends butting. In order to accomplish this, each individual piston ring must be precisely hand ground and finished to each cylinder bore. The optimum size of the ring gap varies by the amount of heat generated and the ring's position on the piston. Variables are mostly limited to whether your engine is naturally aspirated or turbocharged. Victor's technicians precision match piston rings to each individual cylinder bore using highly specialized diamond cutting and finishing techniques to close tolerances. This process assures better cylinder compression and enhanced cylinder performance.